2018 Triumph Street Triple RS. Picture credits - Triumph. Submit more pictures. Taking the specification to the highest level its features include the most powerful engine specification in the family, Brembo M50 monobloc front brake calipers, fully adjustable Showa �big-piston� forks, �hlins STX40 fully adjustable rear monoshock, an additional �track� riding mode, lap timer, quickshifter and Pirelli Diablo Supercorsa SP tires. Price as new (MSRP): US$ 12500. Prices depend on country, taxes, accessories, etc. Frame type: Aluminium beam twin spar. Rear 2 piece high pressure die cast. Front brakes: Double disc. Brembo 4-piston 4-pad radial calipers. Switchable ABS. Rear brakes: Single disc. Nissin single 2-piston sliding caliper. Switchable ABS. Ask questions Join the 18 Triumph Street Triple RS discussion group or the general Triumph discussion group. Get a list of related motorbikes before you buy this Triumph. Inspect technical data. Look at photos. Read the riders' comments at the bike's discussion group. And check out the bike's reliability, repair costs, etc. 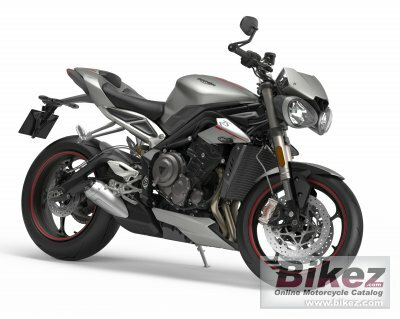 Show any 2018 Triumph Street Triple RS for sale on our Bikez.biz Motorcycle Classifieds. You can also sign up for e-mail notification when such bikes are advertised in the future. And advertise your old MC for sale. Our efficient ads are free. You are also welcome to read and submit motorcycle reviews.